Cougaar Software, Inc. (CSI), an innovative technology company in the Washington D.C. area specializing in cognitive computing and distributed intelligent agent solutions, is pleased to announce the successful completion of the Phase I Experimentation & Demonstration for the Autonomous Supply Point-Scalable Science & Technology Objective ((ASP-S STO), which featured CSI’s Cognitive Automated Supply Point Enhanced Robotics (CASPER) and Configured Load Building Tool (CLBT) prototypes. CSI experimentation demonstrated the feasibility to autonomously plan and manage the operations of incoming and outgoing supply missions. CASPER planned and controlled the operations of military and commercial forklifts outfitted by Cybernet with applique kits to support autonomous operation. The experimentation encompassed all of the essential elements necessary to load, unload, stage, and transfer assets within a supply point while ensuring inventory accountability. The experimentation was conducted throughout September as part of an Autonomous Ground Resupply (AGR STO) program milestone event. 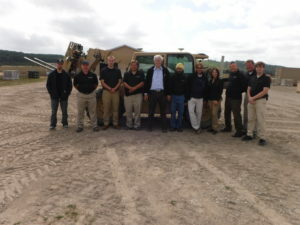 The ASP-S experimentation culminated in a demonstration on 20 September 2017 to Distinguished Visitors and government technical evaluators at the Joint Maneuver Training Center (JMTC) in Grayling, MI. The VIP demonstrations were performed flawlessly and all of the presentations went very well. Participants were informed that General LeMasters was extremely interested in the technology and pleased with the demonstration. At the end of the system demonstrations, the audience toured the autonomous equipment, viewed an ASP-S demonstration video, and reviewed the CLBT & CASPER software interfaces guided by CSI staff. The video was compiled primarily from video captures of the test runs during the event and will be posted on the CSI website after public release is approved.